The Multi SeaLite® fills the void of a high performance mag particle light at a reasonable price. The multitude of configurations makes this light truly multi-purpose. 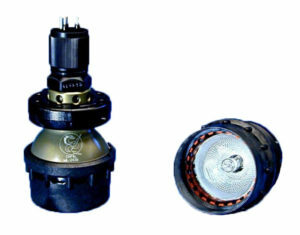 Options include three different reflectors, lamps in varying wattage and voltages, and four types of connectors. Three different DeepSea-designed, user-interchangeable reflectors tailor the light's output from a spot to even, "hot spot"-free medium and wide angle flood beam patterns. An external lens retaining cowl protects the borosilicate glass dome and acts as a baffle to prevent stray light from entering the water column, thus minimizing backscatter. The Multi SeaLite® is 1,000 msw (3,280 fsw) rated and available in aluminum, stainless steel, and titanium housings. The aluminum version has a hard anodized body and an Ultem plastic cowl for increased corrosion resistance. Each rental includes 600 feet of cable. Rentals are available for day, week or monthly rates. Please call today!